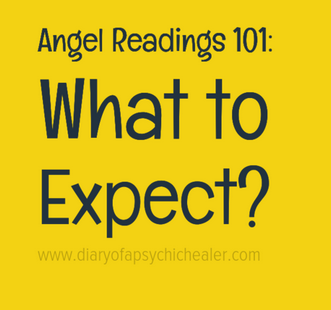 Diary of a Psychic Healer: What are Angel Card Readings like? What are Angel Card Readings like? Today I would like to share a few examples of Angel Card Readings. As you might guess, readings usually start with a question from the client. It could be about romance, career, health or family issues. The cards give us clues about the message and our intuition fills in the gaps. I find that it is easiest to ask for guidance on a topic without going into too much detail about the circumstances. Saying too much upfront is called Feeding the Psychic, and can sometimes confuse the reading. Asking for general guidance on love, life or career is usually enough. Romance questions tend to focus on when a partner will appear, or if the current relationship is the one. The answer often includes emotional healing tools, and ideas on how to go about manifesting that romance. So for example, you might get the message to work on your self-esteem and self-worth so that you can attract partners with a healthier vibration. We often attract people who mirror or complement our issues. Self-healing is away to break those patterns. Today's reading is for Neece, who asked about romance. I pulled three cards, and the first was about finances. My intuition tells me there are trust issues where money and love are concerned. The word prenup came to mind, followed by a second card about Marriage. It feels like one of the parties needs assurances about the other’s affection. Professing their love isn't enough and maybe that prenup is insurance for a rainy day. This could be interpreted literally, hinting at a question about prenups, but its more likely to be about trust. What makes us feel secure in a relationship? The general advice is to balance the Heart, Brow and Root Chakras, because trust has to be based on more than a piece of paper. Self-healing can help Neece be more objective. 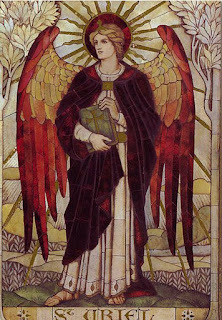 The Past - Six of Earth and Books/Study: The cards came up, were Six of Earth and Books/Study. The first card shows a young fairy dividing her gold coins in two separate piles. She’s trying to make both “projects” work, and to do this she needs a delicate balance so as not to let things topple over. This was a good way to mitigate financial risks while we test the waters with a new endeavor. The second card tells us that Armando studied this situation carefully. This will serve him well in the future. The Present - Five of Water & Career Change: In combination, these cards tell us that things haven’t gone as planned. These cards point to the question: Does Armando need to revise his plans? I’m tempted to say “put your mistakes behind you” and chalk up any failed endeavors as personal growth lessons. The mistakes he's made so far will help Armando polish his business skills in the future. It's time to think about what could be done differently. Learn from the mistakes and build on them going forward. The Future - Queen of Earth & Teaching: The queen of earth is grounded, practical and good with people skills. She's an expert at manifesting. The teaching card that comes up is a sharp contrast to the 1st Books/Reading card. The first is about introspection, learning and cultivating our personal skills. The teaching card is what we send out to the world. I took it to mean that Armando could be more outgoing and vocal with his business efforts. The area to look at may be marketing and communications. Tabbitha sent in the last question, inquiring about her health (especially spiritual health). The headlines on the cards were: Follow Your Heart's Desires, You have the Gift of Healing, Have Faith in your Abilities and finally, The Sun Shines On You. This message is probably meant to remove self-doubt and fear. Our spiritual health is as its best when we’re fearless in the pursuit of happiness. First of all, an apology for answering so late, and YES, the right question is what you suggested. The past: I have been planning and studying very carefully everything related to this change. The present: about the mistakes I've made, these are the opportunities I didn't take a few months ago to invest in the services I need in this new line of business so I can be more efficient. About the future you are right again in that what you have suggested me, because that is exactly what I've been studying: internet marketing and copywriting. Thank you once again!... Wonderful! 😀👍 Thank you! Thank you! Now I am more certain about what I have to do!